The image above was found over at Reddit on We Want Plates. 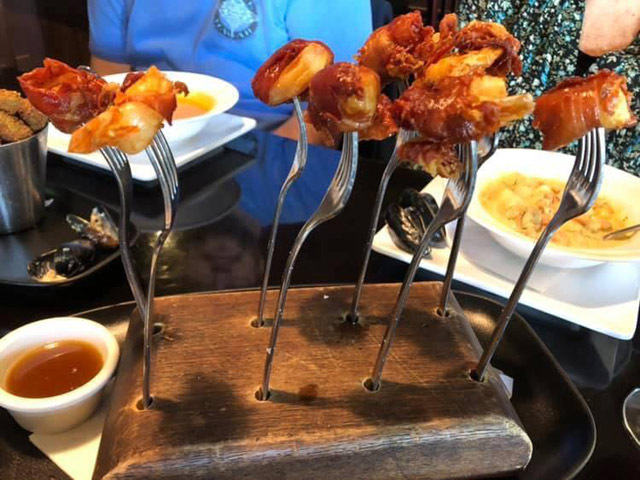 I guess a rather fancy chef thought it would be a good idea to use a lot of cutlery to serve bite sized food. That’s a lot of forks. And probably not a very happy dishwasher. But this does bring to mind how flatware can affect your meal. We use different spoons for different foods such as soup, dessert, coffee, grapefruit and such. We have different knives for butter, steak and cake. We have a couple of different forks I guess. I remember being in Germany and it seemed every brand of beer had it’s own special glass. With the easy access to 3D printing are we coming up on custom cutlery as well? We will see, here at the Cutlery Review.